In this piece from Mountaineer magazine, Glenn Nelson discusses the ways in which the outdoors connects us all. In 2005, Dr. Carolyn Finney visited the Martin Luther King Jr. National Historic Site in Atlanta with her father, a stoic man who grew up in the segregated South. She was startled when he grabbed her with a stricken look on his face. “I thought he was having a heart attack,” Finney said during a recent lecture at the University of Washington. Finney’s is a memorable tale about memory - the kind seared into places and things, as well as into communities of color in America. 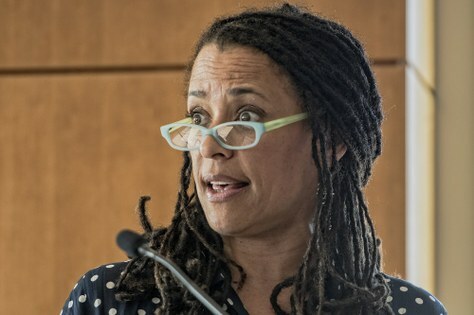 An associate professor at the University of Kentucky, Finney is the author of “Black Faces, White Spaces,” an important study about how the history of this country, as well as the telling of that history, has shaped cultural understandings of access to natural places in the U.S. When I heard Finney speak, I was between two outings that, like many of her accounts, did not fit the traditional stories of people of color in the outdoors. I spent the first day with a trio of bird guides from Colombia. Between their developing English and my poor Spanish, the Colombians and I were forced to connect on a higher plane — that shared sense of awe while beholding a red-breasted sapsucker in Seattle’s Seward Park or a northern harrier in the Samish Flats, about an hour north. With their baseball caps and blue jeans, they could easily have been brown-skinned birders from just about anywhere. But they were guests of Audubon’s International Alliances Program, as a prelude to a partnership for eco-tourism in northern Colombia - ostensibly because birds fly and migrate and connect us all. Water also connects us, a point driven home that weekend with every stroke I took. I was kayaking for the first time in my life, with Latino Outdoors, a burgeoning national group that works to connect Latino communities with nature. Among those in our group were CJ Goulding, who is African-American and a rising young star in the movement to include more youth and racial minorities in nature; bright and dedicated trip leaders, Michelle Piñon and Joe Camacho; my wife, Florangela, the daughter of South American immigrants, and me, the son of a Japanese immigrant mother. A GROUP FROM LATINO OUTDOORS PREPARES FOR KAYAKING. PHOTO BY GLENN NELSON. 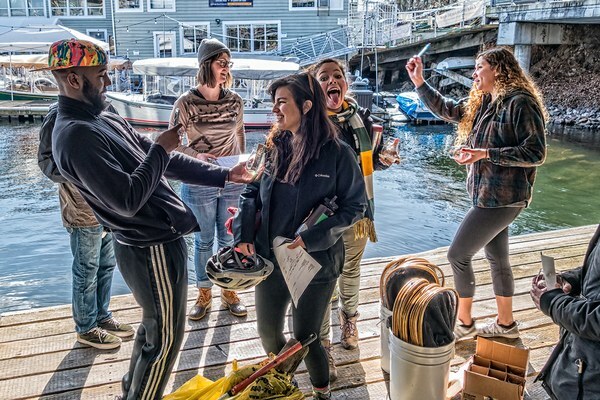 Gliding along Seattle’s Lake Union, I couldn’t help but think how our multicultural, multigenerational group, when replicated throughout the country, helps write a new story about the people who interact with the natural world. Reveling in each other’s company, we created a safe space for each other, and for other people of color to join or emulate. And we interrupted the prevailing negative narratives pounded into our cultures by our own country - from African-American slavery, Japanese-American internment, Chinese-American forced coolie labor, Latino migrant work, to Native American exile from their lands. I must admit, I often struggle with a sense of belonging in nature, the weight of that cultural baggage tugging on my shoulder straps along with lunch and the ten essentials. I’d watched with envy as the Colombians pursue their avian gratification with near abandon, like people in nature and not brown people in a white world. It was their norm, one shared by black and brown people all over the globe, and closer to what I found on the water, the world enveloping yet distant, the people just dots of humanity waving from passing boats or pointing at the pair of circling bald eagles overhead. They could have been anybody; we could have been anybody. And that’s probably the point. An erstwhile actor, Finney has made an academic career out of asking, “Who’s missing from the picture?” and “Who aren’t we hearing from?” She once reviewed 10 years of Outside Magazine and found that, of 6,980 photos with people in them, only 103 (or 1.5 percent) depicted African-Americans. So she has taken to telling the stories of the missing: MaVynee Betsh, who donated her fortune to environmental causes and lived out her days on American Beach in Florida; John Francis, the Planetwalker, who traveled the globe exclusively by foot for 22 years, 17 of which were spent in voluntary silence, and still earned a PhD, became a representative for the United Nations and was one of the original architects of U.S. oil spill policy after Exxon Valdez. Betsh and Francis both are black, and have compelling tales, yet have not been part of the mainstream, environmental narrative. During her presentation, Finney also recalled her own story, growing up on the estate of a wealthy New York developer, for whom her parents were groundskeepers. One day, at 9, she was walking home from school in the tony, white neighborhood. She was stopped by the police, just around the corner from her house. It may have been the first time Finney pondered the seemingly indelible uncertainty of “supposed to be here” with which her father continued to struggle decades later. It’s a question she and the rest of us keep trying to answer. 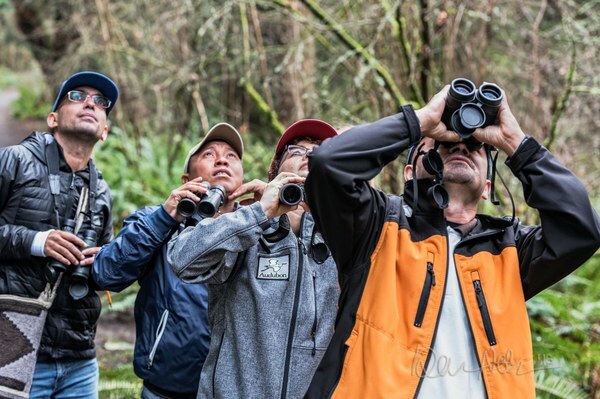 A group of birdwatchers including three bird guides from Colombia through Audubon’s International Alliances Program - Samish Flats. Photo by Glenn Nelson. Glenn Nelson is the Seattle-based founder of The Trail Posse, which in partnership with High Country News covers race, diversity and inclusion in the outdoors. To learn more, visit trailposse.com.